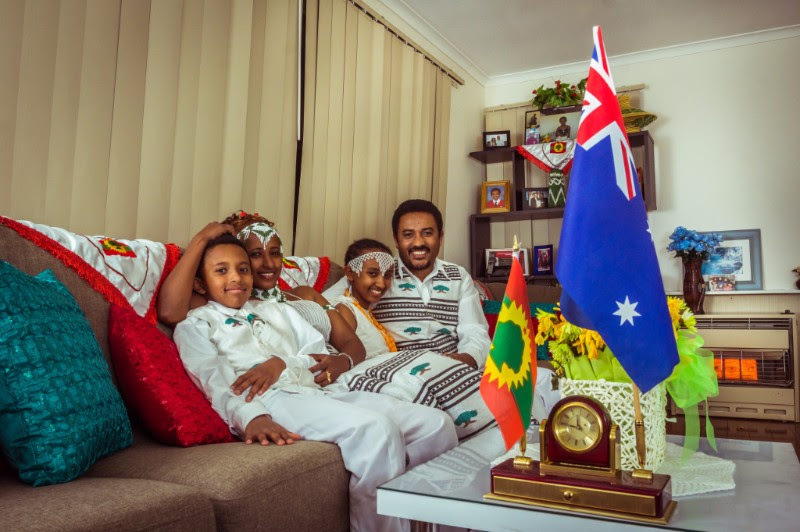 My name is Dabessa and I am an Australian citizen, originally from Oromia, Ethiopia. My wife and I are members of the Oromo community, a group that have been persecuted in our home country for many years. In Ethiopia, my wife and I worked together as journalists for a government-owned TV station. The government were cracking down on anyone they perceived as opponents, which included the Oromo people. In 2004, I was abducted from my office by a group of soldiers. I was detained and interrogated, because they suspected me of sympathising with the Oromo Liberation Front. I was detained for three years in five detention centres, and appeared in front of court 125 times at six different courts for the same case. Finally, I was released in March 2007. In 2007, I fled the country because the government security forces were continuing their daily surveillance of me. My wife continued to work at the same TV station and the government suspected that she had sent me information, so they arrested her and sent her to prison. This happens a lot to journalists in Ethiopia. I managed to get our three children to Nairobi, Kenya, where I was living. I was so relieved to have them with me, but our life remained hellish as we worried so much about my wife’s safety. Our kids never stopped asking where she was, what had happened to her and when she would return. I didn’t know what to say. In 2009, I was brought to Australia by the UNHCR and recognised as a refugee. Life was extremely hard and emotionally draining- as well as settling the family into a new country, I had to support my children and pay legal expenses for my wife in Ethiopia. My wife was eventually released after three years, and we applied for family reunion. My wife’s arrest had been documented in the media, so there was a lot of evidence to show that she wasn’t safe. I thought it would be a quick process but it ended up taking over three years for them to grant the visa. I contacted the immigration department countless times but rarely got a response. When I did, it was a vague comment about ‘security checks’. We were terrified that my wife would get arrested again, particularly if the government found out that we were communicating with one another. Finally, my wife arrived in August 2013, six years after I had fled the country. Seeing her again was one of the happiest days of my life. For myself and our children, being separated from her for all of that time had been excruciating. I am so happy now that our family can live together in safety and peace and really hope that the many other people separated from their families are allowed to reunite with their loved ones soon. To support Dabessa and others like him, sign the #FairGo pledge.